Here are 4 canvases currently progressing in the studio. I had no idea that I have five more canvases currently working. That will certainly keep me busy when the snows come. For years I have recommended having a lot of works in progress, a tip I learned from Wolf Kahn. When he summered in Vermont, Wolf would often make over 100 starts and ship them back to his NY studio for completion. The 4 x 5 canvas in the upper left has been in the works for most of this year and is almost completed. The 36 square on the far right was started last February and I'm still working on bringing it to a compelling conclusion. Do they always take that long? No, but sometimes it takes a number of studio sessions before the true nature of the canvas reveals itself. 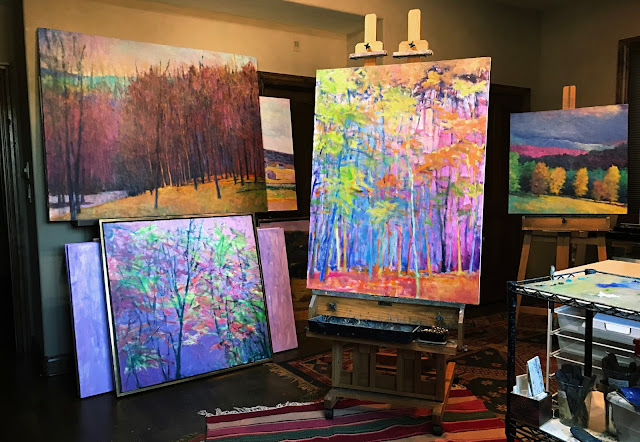 The oils at the lower left and center easel were started this week and I am enjoying the challenge of taking on these subjects in a more abstracted way. Check out the recent video of Forest Light into Shade, oil on canvas, 48 x 48 inches.